We are students, with unique gifts and infinite possibilities. We are parents, desiring community and wholeness for our children. We are educators, committed to academic excellence and whole-child development. We’ve partnered with Compassion Childcare to offer Pre-school at the Westside Campus. To learn more or to register your child, go to CompassionChildcare.com. Tuition doesn’t have to be expensive. We changed that. We strive to do more, give more, and be more for our students, parents and community. 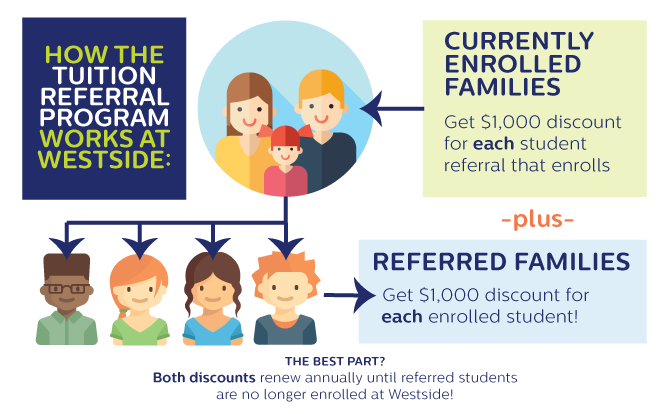 That’s why we have a student referral program. “Gym” is every Monday and Wednesday! Thanks to GreatLIFE Golf and Fitness, we will have the best “gym” class ever – and all for FREE! Our kids have the opportunity to “PLAY EVERYTHING”! Mr. Mike Smith, a prestigious trainer for GreatLIFE, leads our kids to PLAY EVERYTHING. Mike brings a variety of other experts and athletes who love working with kids and fostering a love for an active lifestyle with him! PLAY EVERYTHING includes golf, fitness, sports, bowling and much more. Parents at Westside are actively involved in the educational and spiritual growth of their children by modeling the joy of learning through reading with their children and supporting them at home. Parents also commit to model a passion for Christ and others through quarterly neighbor-loving service days.